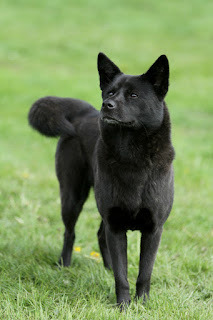 Indigenous to Japan, Kai Ken is a medium sized rare breed with an athletic body, wedge-shaped head, erect ears, robust and hardy limbs, well-developed hocks, and a curled or sickle-shaped tail. These intelligent and loyal dogs occupy a significant place in Japanese culture, preserved as their natural monument. Kai Ken is a very old hunting breed from the Japanese island of Honshu. Although not very large, these dogs hunted a variety of game, even wild boar. The Japanese people designated the Kai Ken as a national treasure in 1934 and, as such, all dogs are protected by law. 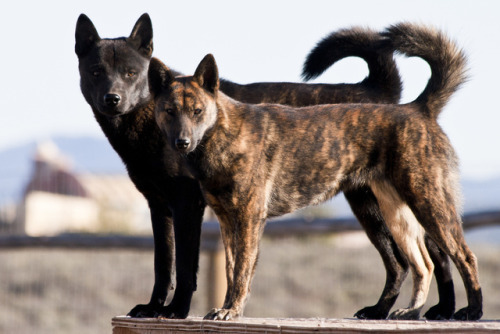 The Kai Ken dog breed stands from 17 to 22 inches tall and weighs 30 to 40 pounds. The head is wedge-shaped, with small, dark eyes and upright ears. The body is sturdy, and the tail curls up over the hips. The coat is double and does shed. All Kai Ken are brindle, although the colors can vary from red brindle to brown and even black brindle. The coat needs brushing twice a week; make sure to get through the thick coat to the skin. During the worst shedding, usually in spring and fall, the coat may need to be brushed daily. The Kai Ken needs daily exercise; however, since the breed retains its hunting instincts, all exercise should be within a fenced-in yard or on leash. The fence should be away from any overhanging trees, as this breed is known to climb trees capably. Socialization should begin early in puppyhood and continue on into adulthood. Training, preferably in a group class, is helpful for socialization as well as behavior. Training should be structured yet fun. The Kai Ken is intelligent, loyal to owners yet aloof with strangers, and very easy to housetrain. This is not a city dog; he rarely does well in the hustle and bustle of an urban environment. 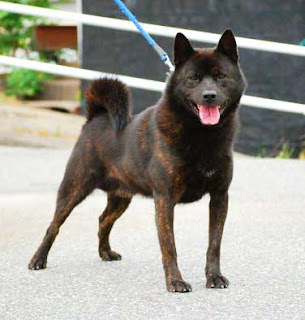 The Kai Ken needs an owner who understands northern and spitz-type breeds. A Kai Ken is devoted and loyal to his family and watchful of strangers. He will thrive with attention and will do best when he can spend time with his owner. The breed is good with children who treat the dog with respect. Although Kai Ken may be good with smaller pets, owners should keep in mind that this breed was bred to hunt and retains those hunting instincts. Kai Ken is a healthy dog breed. Being one of the six native breeds of Japan to be maintained and protected by Nippo or Nihon Ken Hozonkai, it was developed as a hunting breed in the steep mountainous terrain of the Yamanashi region to track down deer, wild boar, bear and the Japanese serow (Kamoshika). This was possibly because of its great climbing ability as mentioned in traditional writings. With the creation of Nippo in 1928, the Kai Ken became Japan’s natural monument in the year 1933. Recognized by the Japanese Kennel Club in 1934, there is little information regarding the breed due to language constraints. It came to the United States in the 1950s, though it is unknown whether the original ones survived or not. When male and female puppies started being imported to the United States, the foundation of the American Kai Ken began. The Kai Kens are bold, fearless, intelligent, alert, agile and loyal having natural hunting instinct, it makes a tremendous watchdog. Kai Ken is wonderful and loyal with its family, but reserved and distant with the strangers. Though, the breed was bred and developed to be an outstanding hunting dog; however, these dogs are very friendly and good with children as well as nice behaving with other dogs without any aggression. Most of them not only like to swim, but also know how to cross a river, and can climb up trees when chasing the quarry. Being highly intelligent breed needs a firm training by gentle and endearing hands. As an enthusiastically devoted and dedicated to the family it will require a lot of care, attention and appreciation from their owner in order to stay happy and cheerful. With a considerable attention, love and care it will do well while staying inside the houses. For such a strong hunting dog early socialization and introductions are very necessary. They would have adequate amount of daily exercise in order to stay happy and healthy; however, never trust it while off lead in an unsafe place, it has a chasing instinct so keep it in a fenced yard. Given the genetic purity of the breed, the Kai Ken is not known to have many congenital health problems. Like all dogs, however, the breed is prone to several minor health issues. The Kai Ken requires only minimal coat care. He needs brushing only occasionally; the most important thing is making sure that there is no matting in his undercoat. It is recommended that he be bathed only occasionally as well. He may benefit from a dry shampoo along with occasional brushing. Their double coat sheds at least twice a year; you may need to strip his coat in order to help remove the old coat so that he will remain looking healthy. The Kai Ken is highly energetic, so it is a good idea to give him as much exercise as possible. The Kai Ken enjoys long walks with his master; he also loves play time of any sort. Owners should focus on playing games that give this inquisitive dog the mental stimulation he craves. It is important that your dog be kept on a leash; he will run if he is not kept restrained beside you. 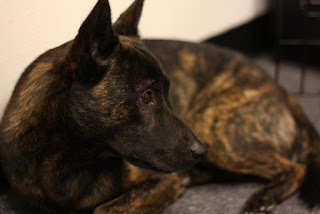 This canine can be happy in an apartment if he has a huge wooded area provided to run in so that he gets adequate exercise every day; however, most experts do not recommend that the Kai Ken live in an apartment unless the owner is prepared to devote at least an hour daily to free play. This breed is known to be very clean and virtually odor-free. 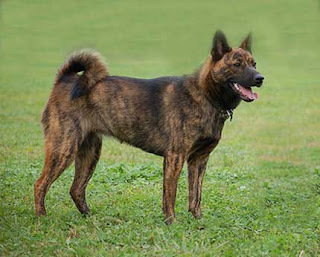 Originally bred to hunt boar and deer, the Kai Ken makes a great hunting dog. These dogs are highly intelligent and respond very well to training, especially if it is started at an early age. This breed learns very quickly so, if you provide firm and consistent training you may be amazed at how much this dog can learn and retain. The Kai Ken is not as independent or strong-willed as some highly intelligent breeds – they have a natural desire to please their human companions. As a hunting breed, the Kai Ken is fairly active but the breed only has moderate needs for exercise. You will not need to take your dog out for hours every day – a long 30-minute walk or a brisk jog will be adequate. This breed is adaptable to apartment life and can get along without a yard as long as its daily exercise needs are met. Because this breed is so intelligent, it requires frequent mental exercise as well as physical exercise – plan to engage your dog in games often and consider agility training to keep him sharp and active. They should be brushed weekly to keep their fur mat free and clean. Bathe them as necessary, depending on how dirty they are. Their ears should be checked routinely for wax build up, infection or dirt. Their nails should also be trimmed regularly. Kai Kens shed once or twice a year, making grooming at these times needed. Kai Kens should be trained from puppyhood, as they are very willful. If early socialized, the Kai Ken is wonderful and loyal with its family, but reserved and distant with the strangers. Though, the breed was bred and developed to be an outstanding hunting dog; however, these dogs are very friendly and good with children as well as nice behaving with other dogs without any aggression. Children should be taught how to treat and interact with such kind of dogs. Is the Kai Ken the Right Breed for you? Low Maintenance: Infrequent grooming is required to maintain upkeep. Difficult Training: The Kai Ken isn't deal for a first time dog owner. Patience and perseverance are required to adequately train it. The box art of the video game Ōkami. Slightly reserved with strangers, the Kai Ken has very strong protective instincts. It makes an excellent watchdog. In fact, the Kai Ken often prefers to keep watch from a spot with a good vantage point, like a porch, a balcony or a hilltop. 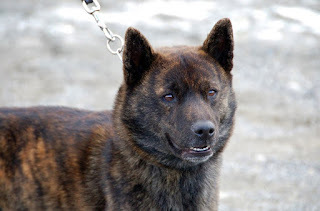 Many Kai Kens play important roles in the Yoshihiro Takahashi's series Ginga: Nagareboshi Gin and its sequel, Ginga Densetsu Weed, including the brothers Kurotora, Chūtora, and Akatora. In the sequel, Ginga Densetsu Weed, Kurotora's son, Kagetora, stars as an important character, with his less prominently featured brothers, Harutora and Nobutora, and cousins Dodo, Buru, Shōji, and Shigure. Another Yoshihiro Takahashi's manga, Kacchū no Senshi Gamu featured a villainous Kai Ken named Gama. 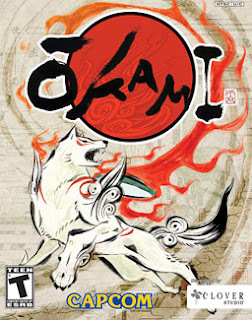 Chu, a Canine Warrior from the 2006 video game Ōkami, is also a Kai Ken.